Hand sprayer with adjustable nozzle for distributing cleaning agents and solvents, for example CB 50 Superclean or Varioclean. Filling volume 1.5 l, maximum pressure 3 bar, EPDM seals for cleaning agents and solvents in the pH range 7 – 14. 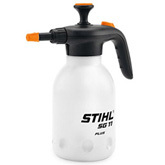 The pump is fitted with a special protective element that ensures a long service life.